The links below take you to Portable Acrobat Format (PDF) files of all invited and contributed papers, together with slides from oral presentations and additionally posters. 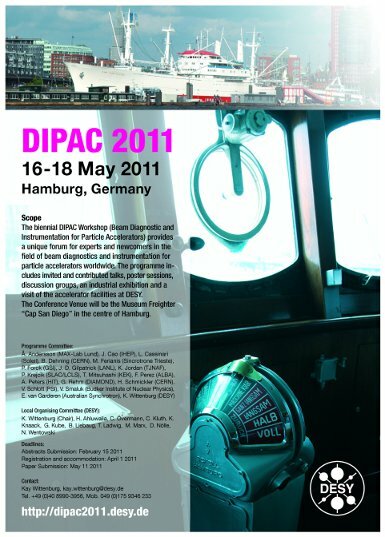 With 291 registrants DIPAC'11 was the largest and the last event in the DIPAC conference series. In the future DIPAC will be replaced by IBIC, a fusion between DIPAC and BIW (Beam Instrumentation Workshop). and held aboard the museum freighter Cap San Diego, during May 16-18, 2011 in Hamburg, Germany. The Photo gallery is by courtesy of Dirk Noelle (DESY) and Michaela Marx (DESY).